What a fantastic week of reading! I am avoiding spending our pennies, so I have spent quite a few hours at home reading. What better way is there to save money than to spend time at home reading? I have to admit, I spent my entire weekend crocheting, reading, and watching reruns of Downton Abbey. It was a bit perfect! 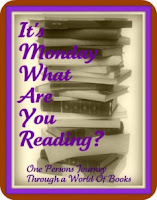 Whatcha readin' this week @ the Brunette Librarian and Don't forget to enter to win Philippa Gregory's "Changeling"
have a good week of reading! I am waiting for my copy of The Chalice to arrive. Did you read the first one, The Crown? I have that on my shelf waiting to be read. I did read The Crown and loved it! I was definitely excited to get The Chalice, can't wait to start it! !